Former Preston North End and England striker Tommy Thompson has passed away at the age of 86. Thompson was regarded as one of the finest inside forwards of the 1950s, with him a prolific goalscorer throughout his career. In 444 league games for five clubs, he scored 222 goals, an average of one every two matches. Thompson found the net 128 times in his six seasons at Deepdale, playing in the same front line as Sir Tom Finney – with who struck up a superb partnership and friendship. In the 1957/58 season, one in which PNE were runners-up in the First Division, Thompson scored 34 league goals. 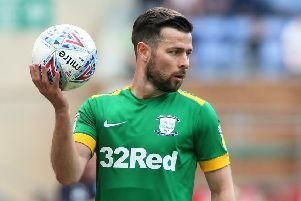 That remains a Preston club record in the top flight and 17 of those goals came in 11 successive games – another PNE record. Thompson won two England caps, playing against Wales and Scotland. The clash with Scotland at Wembley in 1957 saw him line-up in the England attack with Sir Tom and Sir Stanley Matthews. Recalling playing against the Scots in an interview with the Evening Post in 2007, Thompson said: “I shall never forget the Wembley international against Scotland. “Stan Matthews was outside right, I was inside right and Tom was centre-forward. Born in Hoghton-le-Spring, Thompson started his career with Newcastle, with Jackie Milburn and Len Shackleton among his team-mates. A £12,500 move took him to Aston Villa in 1950 and during his time in the Midlands, he won his first England cap. Thompson’s 76 goals in 165 appearances for Villa caught Preston’s eye and he moved to Deepdale in May 1955 for £27,000. His North End debut came in a 4-0 win over Everton at Goodison Park on the opening day of the 1955/56 season, in fact Thompson scored in his first four games. He finished top scorer with 24 goals, bettering that the following campaign by finding the net 29 times – including a hat-trick in a 6-0 home victory over Sunderland. Those goals, together with 28 from Sir Tom, saw PNE finish third in the First Division. The 1957/58 campaign was a golden one for both North End and Thompson, who was nicknamed ‘Topper’. They finished runners-up to Wolves in the title race, the team scoring 100 goals in their 42 league matches. Thompson bagged 34 of those, Sir Tom 26 and Sammy Taylor 14. Thompson’s goal in a 4-2 defeat at Arsenal on December 14 1957, began a remarkable scoring run. He scored for 11 league games running, a hat-trick coming in an 8-0 win against Birmingham City. The following season, Thompson was leading scorer once again with 21 goals. In the 1959/60 campaign, it was Sir Tom who finished above him as PNE’s top scorer, appropriate with that being Sir Tom’s retirement year. Knee injuries hindered Thompson in the 1960/61 season as North End were relegated from the top flight. Following relegation, PNE sold Thompson to Stoke City where he played alongside Sir Stanley Matthews and scored 17 goals in his first season. He moved to Barrow during the 1961/62 season where he scored 18 goals before retiring. In addition to his two full England caps, Thompson played and scored for the England ‘B’side. He turned out for the Football League and the FA in representative games and captained North End on an end of season tour to South Africa. After his retirement from the game, Thompson worked in a family joinery business. He stayed in Preston and was a close friend of Sir Tom. Thompson was an active member of the PNE Former Players Association. A group of them had an allotment in Fulwood and would meet on a weekly basis for a spot of gardening and a catch-up over a brew in the shed – known as the Tommy Thompson Suite. Thompson died on Tuesday morning in hospital.